The contributions of Japanese immigrants in the Santa Clara Valley are an integral part of the rich multicultural agricultural history of this area. Japanese farmers contributed a great deal to the agricultural economy along with other ethnic and immigrant farmers. Their story is one that begins over one hundred and twenty-five years ago at a time of great industrial growth and transformation in the Western region of the United States. Japanese immigration to the United States was primarily driven by the demand for labor. Numerous factors contributed to the growth of Japanese farmers both in Hawaii and on the mainland United States. Beginning in the 1860s through the 1880s, Japanese workers were recruited by labor contractors who supplied workers to large sugar plantations in Hawaii. The conditions on the plantations under the contract labor system were brutal. As a result, the Japanese laborers sought ways to escape and some found their way to the mainland United States. By the 1890s, Japanese labor became important to the mainland United States. 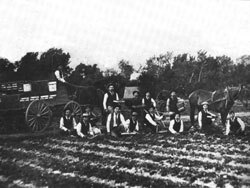 Agriculture in the Santa Clara Valley, as in the rest of California, came about as a result of the Gold Rush and the need to feed the growing population of the San Francisco Bay Area. Grain crops such as wheat were grown in order to meet the demand for flour by miners. Chinese workers came to cultivate and grow vegetables and seed crops. Beginning in the 1870s they helped to establish orchards and focused their work on fruit production. Many landowners used Chinese immigrants as farm laborers. But tensions increased among white ethnics over the use of Chinese labor. California's anti-Chinese movement was an outgrowth of such tensions. Such reactions culminated in the passage of the Chinese Exclusion Act of 1882. As a result, the numbers of Chinese laborers dramatically diminished in the late 1880s and 1890s. A few Japanese immigrants began to work as agricultural workers in California in the late 1880s and early 1890s. The Japanese were recruited to work as laborers filling the vacuum created by the Chinese Exclusion Act which prevented Chinese laborers from coming to the United States. Thus, by 1895, Japanese laborers were working in the Santa Clara Valley as migrant farmworkers. As was the pattern in farm labor, the Japanese as well as other ethnic groups who followed such as Filipino and Mexican workers, were employed in low wage, unskilled work to cultivate, harvest, and can fruits such as strawberries, prunes, pears, and apricots. After a short period, a number of Japanese laborers moved out of migrant labor to become independent farmers in their own right. They could become sharecroppers and make contracts with landowners to work the land and split the proceeds of the sale of the crops. If they had some capital, they could also lease or purchase land. In the process, these Japanese laborers began to make a commitment to remain in the United States for a long period of time. Families were established through the picture bride system and children were born in the United States. Farming communities of settled Japanese families were formed throughout the Valley. They arrived at an ideal time to participate in the developing fruit production industry. These Japanese farming families could sustain and manage labor intensive fruit orchard farms. Some Issei like Yuwakichi Sakauye, were able to purchase small farmsteads in the early 1900's, before the California Alien Land Laws were enacted. The Sakauye family still owns this farm. Collection of Eichii Edward Sakauye, California History Center Archives. As these farming ventures became successful and encouraged more Japanese laborers to start their farms, major political parties and organized labor in the 1900s began to protest Japanese immigration and land ownership. In 1907, the Gentlemen's Agreement stipulated that Japan would not issue visas to Japanese laborers to travel to the United States and that Japanese with visas to Hawaii, Canada, and Mexico could not enter the United States. In 1913, the California State legislature passed the Alien Land Act prohibiting aliens ineligible for citizenship from purchasing land and other property. This act was specifically aimed at Japanese farmers, since Asians were ineligible for citizenship and the Japanese were the only group of Asians purchasing land at the time. During this period, Japanese farmers became successful in the growing of lucrative crops such as celery. By the 1920s, Japanese farmers were producing the majority of the tomato and spinach crops. Other important crops included strawberries and celery, and later deciduous fruit trees. Throughout the Santa Clara Valley, Japanese farms were clustered in various regions. Trimble Road, North First Street, Alviso, Agnew, and Berryessa were major concentrations. The towns of Mountain View, Santa Clara, Cupertino, Saratoga, and Los Gatos also had concentrations of Japanese farms. By 1940, Japanese Americans were well established in farming, with some twenty-five percent of the farmers owning their land in Santa Clara County. With the onset of World War II and the removal of Japanese Americans from the West Coast, the Japanese had to face the losses associated with their hard work in developing the land. Those fortunate enough to own their land would have to find reliable renters to care for their property. After World War II ended, Japanese Americans returned at a time when there was a scarcity of labor. Many who ran their own farms had to become migrant farm workers. Those who had strong friendships with local families who promised to care for their land and property found their farms intact. Many Japanese Americans came to work in the valley as migrant farm workers temporarily because of the availability of housing but left as soon as they could find other work and unify their families. Some became tenant farmers and became successful in growing strawberries in the late 1940s and early 1950s. However, with the rapid suburbanization and industrialization after the World War II, land in the Santa Clara Valley became too expensive for farming and many of the second generation had to find other employment opportunities. Many of the sons and daughters, as well as grandchildren of Japanese farmers were reluctant to follow in the footsteps of the immigrant generation. Succeeding generations are now college educated and trained in professional and technical fields and farming today is no longer the main economic form of production within the Japanese American community. Kitano, Harry, The Japanese Americans (Immigrant Experience) (1995) Chelesea House Publishing, ISBN: 0791033805. This book describes many historical and cultural aspects of the Japanese immigrants. Reading level is 6th through 12th grades. McDaniel, Melissa, Japanese Americans (Spirit of America Our Cultural Heritage) (2002) Child's World, ISBN: 1567661548. This 32 page book tells a brief history of Japanese Americans in the United States from the Issei immigrants to the forced relocation of World War II. Reading level is 4th through 6th grades. Steoff, Rebecca, and Takaki, Ronald, Issei and Nisei: The Settling of Japanese America (The Asian American Experience) (1994) Chelsea House Publishing. ASIN: 0791021793. This book is adapted from Ronald Takaki's Strangers From a Different Shore. It is a history of the Japanese Americans with chapters about the Issei and their children, the Nisei. The book does describe the Issei immigrant experience for children. Reading level is 4th through 6th grades. Ichioka, Yuji, The Issei: The World of the First Generation Japanese Immigrants, 1985-1924, (1988) The Free Press, ASIN: 0029324351. This is one of the most detailed books about the Issei generation, why they left Japan, and what hardships they faced in America. Japanese American Resource Center, Regenerations: oral history project: rebuilding families, communities, and civil rights in the resettlement era, Volume 4 San Jose, 2000, Japanese American National Museum, Los Angeles. Available from the Japanese American Museum of San Jose, www.jamsj.org. Lukes, Timothy J. and Okihiro, Gary Y (1985), Japanese Legacy: Farming and Community Life in California's Santa Clara Valley, California History Center, ISBN: 0-935089-09-8. This book is the most concise description of the Issei farming communities of the Santa Clara Valley. Now out of print, this book is available from alibris at www.alibris.com. Matsumoto, Valerie, Farming the Home Place: A Japanese American Community in California, 1919-1982 (1994), Cornell University Press, ISBN: 0801481155. This book is about the experience of the Cortez colony, the last Japanese agricultural community formed by Abiko in 1919. It is written from a feminist perspective and thus gives unique insight into the Nikkei experience. Misawa, Steven, Beginnings, Japanese Americans in San Jose: 8 oral histories, San Jose, California (1981). Steven Misawa was able to interview eight Issei immigrants and recorded their experiences in San Jose. Most were farmers or in the nursery/landscaping business. The book has both Japanese and English text. Now out of print, this book is available from alibris at www.alibris.com. Neiwer, David, Strawberry Days: How Internment Destroyed a Japanese American Community (2005) Palgrave Macmillan Publisher, ISBN: 140396792x. The poignant story of a Japanese American community torn apart by racism and WWII internment Strawberry Days tells the vivid and moving tale of the creation and destruction of a Japanese immigrant community. You may find others by typing "agricultural exhibit" and the state abbreviation in any search engine. 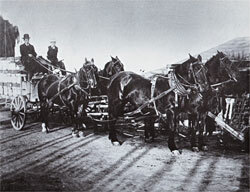 Workers during the 1905 strawberry harvest at the NKS Farm. The Issei did not usually dress like this for farm work, prefering long sleeved cotton shirts and overalls or denim pants. These men put on their best clothing for the photo session, and probably sent prints back to relatives in Japan. Collection of Eichii Edward Sakauye, California History Center Archives. This was the Sakauye family produce wagon, a Studebaker, which was used until the purchase of a truck in 1917. The wagon and the truck are now on exhibit at the Japanese American Museum of San Jose. Collection of Eichii Edward Sakauye, California History Center Archives.